Well I guess it's a fairly simple explanation as to why I love this combo. If you followed my blog over the summer you would know I was a huge fan of pastels and this look is a perfect way to transition the trend into fall. Pastels are still on trend but I now prefer them in smaller doses and something like this coral scarf is that perfect bit of accessory to do just that! Wearing coral with brown really creates a season appropriate outfit. We tend to turn to darker colours over the wintery months but playing with pops of colour should always be welcome to brighten the mood. Aside from the lovely complementing colours in the inspirational picture above is the use of the scarf. For myself personally, a scarf is my favourite accessory over fall/winter. Whether you wear one to turn an outfit into one less boring, use it literally as an accessory piece to be the focal point of your outfit or heck just to keep you warm outside but still look fashionable, a scarf really is a versatile piece that should be a staple in your closet this season! 1 JBrand. 2 Vanessa Bruno Athé. 3 Chan Luu. 4 Brooks Brothers. 5 Gorjana. 6 Carolina Bucci. 7 Asos. 8 Jeffrey Campbell. 9 Michael Kors. What a beautiful and unique combo! It is a really great combination. You have really great style. I love that scarf! i LOVE this combo! xO! Beautiful combination! Like the first photo! 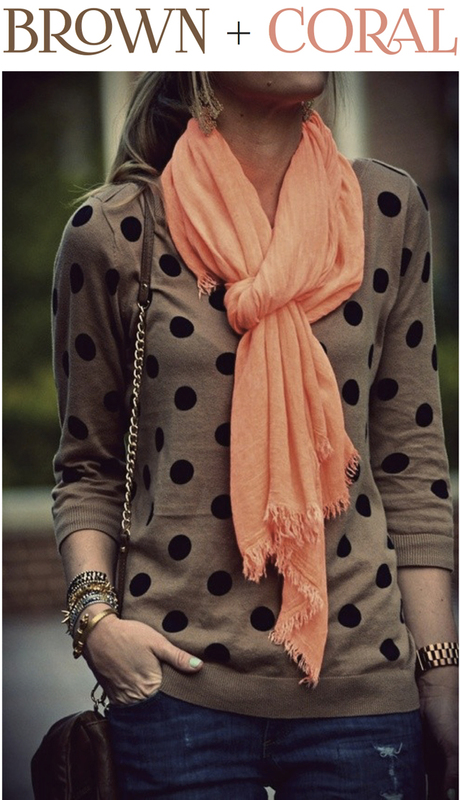 Love that polka dot sweater! Love the watch, and I am always a polka dot fan.